"We're moving to a model of peer-to- peer teaching"
Free software is helping people make the world better. And here are two of them: Neil Sullivan and Laurent Savaete. 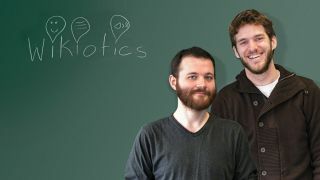 As founders of Wikiotics, they're on a mission to make it easier for everyone to learn languages. Linux Format magazine caught up with them at FOSDEM to find out why they're doing it, how the economics of teaching fail and why Hungarian phrasebooks are trickier than they sound. Linux Format: Wikiotics is a completely open, editable resource. Is it for teachers, or is it for real people? Neil Sullivan: Both. It's a wiki, so it's editable by anyone in the community. We designed it with teaching in mind, but I've been building lessons and I'm not a teacher. Being able to build your own materials and customise materials for your own personal study, or for a friend, is pretty central to the design of the system as well. LXF: What sort of advantages do you think that a wiki structure offers over the more usual top-down language learning websites? NS: Language teaching is really customised in terms of structure. Every teacher has their own tweaks that they want. When I was learning Mandarin, every time we got to a new section in the textbook we would start off by opening our books, crossing out all of their definitions from the new vocabulary and writing our teacher's new vocabulary, slightly tweaked. "I don't think they're teaching it right; this isn't to our curriculum; we would have to change what we're doing to fit their presentation of the material and their expectation of how students are going to learn." LXF: Who's the other chap, the chap in California - Jim? NS: Jim and I used to work together, and about the time I was talking about how bad the existing tools were and how simple it would be to make new ones, he said: "Yeah, that would be easy enough," and started building them. He's a graduate student in physics in California. And he has a long free software background, at least compared to me. I came in more on the social and political end of the spectrum and he's definitely at the coding end, so he built the main infrastructure. We all met in New York two months ago for a week and we took all the different lessons that we'd learned, from presenting different systems to people and seeing them interact, and combined the types of lessons that we were offering. We tore the interface of the site apart, drew everything out on paper and said: "Here are all the different ways you get to the front page, what can you do when you get to the next page? What can you do to guide people directly to the simplest ways to start learning or teaching?" LXF: What stage is the project at now? Is it live? NS: It's definitely live. The people who're using it are mostly people we work with individually, so it's a handful. But, again, with the toolmaker's dilemma, we spent a lot of time engineering the capabilities. And we're pretty confident that with the UI rewrite, which we're actively deploying at the moment, and the different lesson types that we have, it's capable. You can build a series of lessons, or individual lessons, that are new for teachers or students of differing capabilities. We've been able to do things like build an interactive picture-choosing lesson. It wouldn't be terribly complicated to do that as a one-off website, but most teachers have a lot to do, and they don't have time to learn some CSS and HTML, throw up a website and find some hosting. Laurent Savaete: The thing you're maybe not emphasising enough is that we're not only looking at it from a top-down perspective, of teachers teaching students. We're also moving to a model of peer-to- peer teaching, as in: you're a native English speaker and you want to learn Italian, and you're probably going to find somebody who's speaking Italian somewhere as a native speaker, and they want to learn English; that's quite a likely combination. NS: And when we say that we're building lessons, we're building lessons with the intent of seeding content into the system, because it's so much easier to take existing lessons and fit them to your use than it is to start from fresh. LS: Plus that's something that works in New York or in Paris, but if you want to learn Vietnamese and you're in a small town, you might not necessarily find someone who speaks that language. LXF: If the lessons are editable, how do you stop trolls from making a mess of them? NS: There's a Monty Python sketch from the very early years called The Dirty Hungarian Phrasebook, where John Cleese goes in to a tobacconist's shop and reads from his phrasebook a series of what he thinks are simple sentences to ask for cigarettes and a packet of matches. But in the traditional Monty Python way, the phrasebook translates the "may I have a book of matches" phrase as "my hovercraft is full of eels," which leads to madcap comedy. But that's also the problem that most of the collaboration-focused language instruction projects out there have run into. If you're in the community and you know all of the other participants, you can generally get a sense of how trustworthy the individual materials are. But anyone coming to the site directly has no idea about who the authors of this material are. That was one of the big challenges that we were designing towards at the beginning, and our solution is that the wiki has three different places for content: there's the big public wiki, where anyone can edit or create content. You create an account, log in and you can just go there and do things together, to keep the system as flexible and open and welcoming as possible. And there are two other areas for users who have created accounts. One is a private user area; so you create an account, pick a username - you get wikiotics/accounts/your username, and you can put any pages after that that you want, and only you are able to edit them. So anyone coming to the site can see that this user has a collection of lessons, and there's a user page at the front, and you tell people: "I'm a teacher in Antwerp". And they'll know that maybe you're a spammer, maybe you're a prankster, but if there are spam or pranks in your user area, it's because you put them there, and they should distrust the rest of your materials or trust the rest of your materials correspondingly. The group section is the same thing but for users who want to get together, because they're in a study group or a faculty at school, and collaborating in the same kind of protected way. Also, it's a way for people to create collections, manicured archives of material. You could look at all of the material put out by different English teachers and decide that many of them are good, but none of them were quite right. So you could pull in the ones you like, organise them and change them a little. You could decide that they should all have consistent audio, so you go through and you hear the same series of voices throughout these disparate collections of lessons. Or you could take all of them and replace all of the pictures in the picture lessons with pictures of dogs, and change the vocabulary. So if you just really like dogs, you can learn counting and position and colours and sizes and whatever you like without having to look at all those silly pictures of people and houses and cats. LXF: That sounds like it would have commercial implications as well. If you're putting good work in, then your reputation doesn't get trashed if someone comes along and vandalises it. NS: And this is something that language teachers are interested in. As a language teacher, it's difficult to gain any sort of recognition or advancement; it's difficult to find students. Or how do you evaluate which tutor is good? Your students are naive clientele; they can't evaluate how well you teach the material versus someone else unless they have already invested time in going to both.